The Olympics have me thinking about the incredible accomplishments of canine athletes. These dogs impress me just as much human athletes, and watching the bond between trainers and their dogs during agility and flyball competitions is absolutely inspiring! A lightening-fast Border Collie named Jazz set the Guinness World Record for the Fastest Dog Weaving Between Poles. Jazz weaved between 60 poles in 12.98 seconds. Watch the video here ... it's amazing! I think most dog people know that the fastest dog is, of course, the greyhound. Guinness has clocked the fastest greyhound at 67.2 km/h. Give that dog a gold medal! 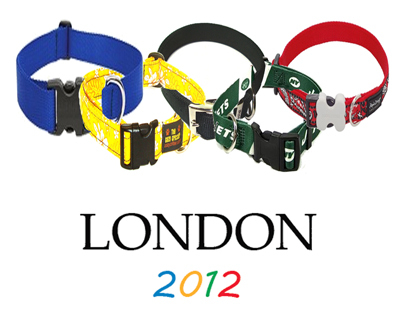 .... gold and silver medals are available now at PetBling.ca! I was on a walk with Harry recently and stopped for a quick chat with some neighbours - also out walking with their dogs. After a few minutes a very concerned lady jogged over to our little group and asked if we had seen her lost dog, a black lab named Bella. We hadn't, but asked if Bella was wearing her collar and ID tag. 'Yes, she was wearing both', the lady answered. I kept a close look out for Bella that day, and was very relieved to hear that she had been found - I can only imagine how her family must have felt. Bella was a very lucky girl; her family was lucky, too. No one ever expects their pets to get lost, but accidents happen: the front door gets left open a few seconds too long; the backyard gate didn't latch properly; a strong dog pulls away from the child walking him. Suddenly your dog or cat is lost. Many pets without proper identification don't return home. An ID tag is an inexpensive way to make sure that anyone who finds a lost pet has the pet's name and contact information. Micro-chips are great, but will the person who finds your lost dog or cat have the time to take them to a vet clinic or animal shelter to be scanned? ID tags provide contact information immediately, so that you and your lost pet can be reunited as quickly as possible. Dogs and cats can't tell time! They may become lost during the vet clinic or animal shelter's off-hours. ID tags can help your pet get home any time of the day. If your dog or cat is wearing an ID tag, you can get a call from the person who finds him right away, avoiding a trip to a shelter or clinic to be scanned - that's a lot less stress for you and your pet! ID tags provide your pet's name. 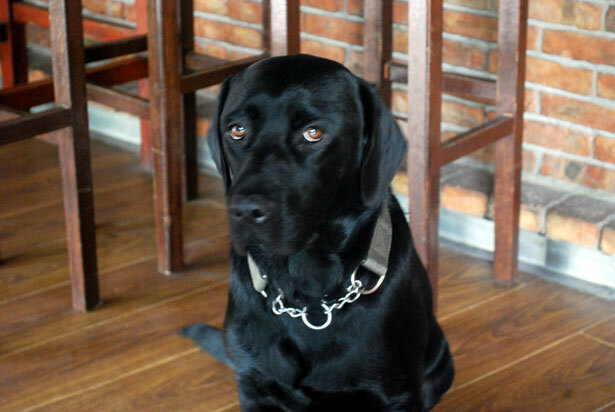 Knowing the name of a lost dog or cat can mean a quicker reunion (a lost black lab is more vague than a lost black lab named Bella). 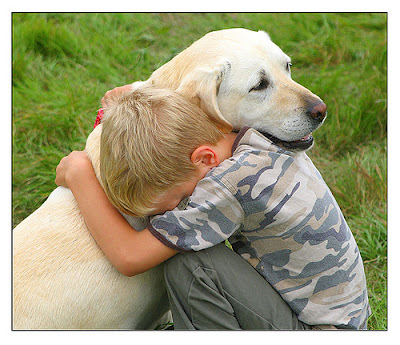 Plus, it's comforting for a lost dog to hear the familiarity of his own name. ID tags and micro-chipping work well in combination with each other. Collars (with attached ID tags) may become lost. Ultimately though, you don't know which form of identification will be the most useful to the person who finds a lost pet. Multiple forms of identification (micro-chip and ID tags) greatly increase the likelihood of a lost pet returning home. Do remember to update your contact information every time you have a change of address or phone number. 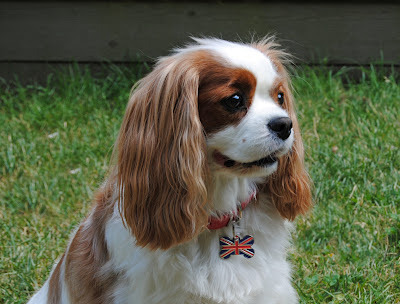 With the huge selection of dog and cat id tags available, why not choose one that expresses your pet's unique personality. Designer ID tags can be a fantastic conversation starter! It has been a scorching summer so far! If your dog is like mine, he wants to be everywhere you are. When I'm outside enjoying the beautiful summer weather, Harry is right there beside me. 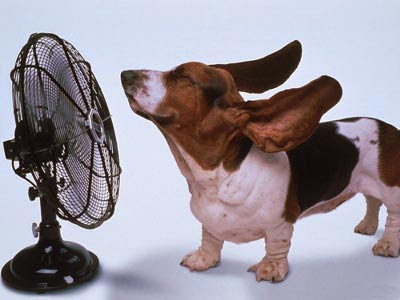 On hot days, dogs enjoy cool treats as much as we do. Mix two or three spoonfuls of peanut butter with one spoonful of unsweetened applesauce. Thin the mixture with a bit of water and add a few unsalted peanuts. Pour the mixture into ice cube trays and freeze until solid. Harry is quite a peanut butter connoisseur, but he also loves cold watermelon chunks and even frozen peas on occasion!